Trends from last year reveal a sharp rebound in views of the EU in a number of countries: up 18 percentage points in Germany and France, 15 points in Spain, 13 points in the Netherlands and 10 points in the UK. This upswing is the latest shift in an up-and-down cycle over the past decade. Younger Europeans, who have never known a world without the European project, hold particularly positive views of the Brussels-based organization. A median of 73% of those ages 18 to 29 have a favorable opinion of it, compared with a median of 58% of those ages 50 and older. The generation gap is largest in the UK (33 percentage points between young and old), the Netherlands (23 points) and France (22 points). Publics are also sharply divided along ideological lines in their views of the EU. For the most part, people who place themselves on the left of the political spectrum are more favorably disposed toward the EU, at least compared with people on the right. This gap is 43 points in the UK, 36 points in Italy, 20 points in Poland and 19 points in Germany. 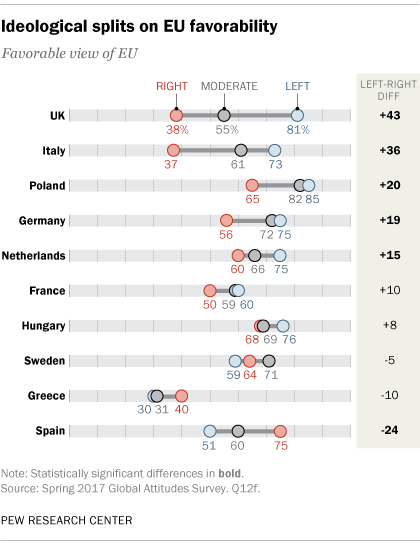 Notably, in Spain, the right has a significantly more positive view of the EU, resulting in a gap of 24 points. As might be expected, most adherents of Euroskeptic parties do not share the generally positive view of the EU. In the UK, just 31% of those who voice a favorable assessment of UKIP hold a favorable opinion of the EU. And just 41% of the public that expresses a favorable view of the Party for Freedom (PVV) in the Netherlands see Brussels positively, as do 40% of those who favor the National Front in France and 40% of those who look favorably on the Alternative for Germany Party (AfD) in Germany. A party’s criticism of the European Union does not, however, always mean its adherents share that negative view of Brussels. In Italy, 60% of those who look favorably on the Euroskeptic Five Star Movement have a positive view of the EU. In Poland, where the ruling Law and Justice (PiS) party is in a long-running feud with the EU, 65% of Poles who see PiS favorably still hold a positive opinion of the institution. Better economic times have not necessarily boosted confidence in the EU’s economic policies. A median of just 42% approve of how Brussels has dealt with economic issues. The Greeks (12%), Italians (23%) and French (35%) are particularly unimpressed. 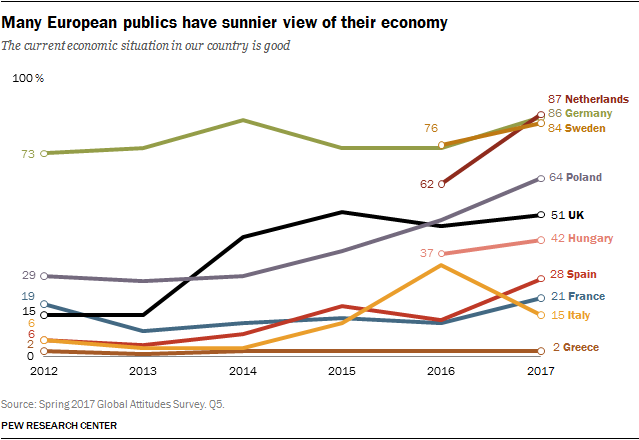 Only in Germany (61%), Poland (58%) and the Netherlands (54%) do majorities hold a positive view of Brussels’ handling of the economy. In these three countries, approval of the EU’s economic management is up since last year – by 14 percentage points in Germany, 12 points in the Netherlands and 11 points in Poland. In 2016, Brussels’ economic management failed to surpass 50% approval in any European country surveyed. In Hungary, Italy and Poland, leftist respondents are more likely than rightist respondents to approve of the EU’s economic management. For example, only 14% of right-leaning Italians approve of the EU’s economic policies, but 35% of left-leaning Italians approve. However, in Spain, 48% of people who place themselves on the right support Brussels’ efforts, compared with just 27% of those on the left. Europeans are even more critical of the EU’s handling of the refugee issue. In nine of the 10 EU countries surveyed, publics overwhelmingly disapprove of Brussels’ efforts. This includes 90% of Greeks, 80% of Italians and 78% of Swedes. The first two nations have been on the front lines of the recent European refugee crisis, often being the first port of call for migrants from Nigeria, Eritrea, Sudan, Syria and Libya. And in Sweden, refugees make up a larger portion of the population than in any country in Europe. In Germany, Hungary, Italy and Poland, respondents on the right of the ideological spectrum are less likely than those on the left to approve of the EU’s performance on refugee issues. For example, only 23% of Hungarians on the right are happy with EU refugee policies, but 43% of left-leaning Hungarians are satisfied. However, in Spain the right is more positive – 37% of right-leaning Spaniards approve of the EU’s actions, compared with just 23% of Spaniards who lean left. Those who have a favorable view of anti-immigrant parties are particularly judgmental about Brussels’ handling of refugees. Among Swedes who have a favorable view of the Swedish Democratic Party, 84% disapprove of what the EU has done on refugees. For the French who see the National Front favorably, 76% criticize the EU on refugee policy, as do 67% of the Dutch who favor the PVV.